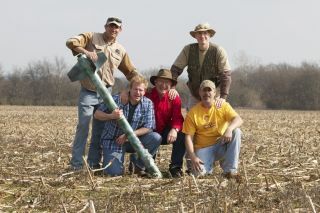 Rednecks pose with their moonshine-powered rocket post-launch. (L to R) Michael Taylor, Travis Taylor, Charles "Daddy" Taylor, Pete Erbach (standing), Rog Jones. HUNTSVILLE, Ala. — If you like drinking beer, explosions, cussing and shooting rockets, then boy, does the National Geographic Channel have a show for you. "Rocket City Rednecks," a new DIY science reality show, makes its cable TV debut on the National Geographic Channel Wednesday night (Sept. 28 at 9 p.m. EDT — check local listings), two days after its world premiere here at the Davidson Center for Space Exploration at the U.S. Space and Rocket Center, before a cold-one cracking, hooting and hollering crowd. In the series premiere, the Rednecks' so-called "hillbilly ingenuity," is on full throttle as they try to bomb-proof a truck using beer cans and launch a moonshine-fueled rocket, all while shouting their motto of "safety third." The show is more than an excuse to blow things up. In each of the episodes, the Rednecks try to solve big problems in military and space research by inventing new, cheap technology. "People at NASA are gung-ho about finding alternatives to rocket fuel," said Travis Taylor, the show's ringleader, as he outlined a moonshine distillation game plan. "Who knows, maybe one day something as renewable and abundant as corn could get us to another planet." The show is filmed in Huntsville, where German rocket scientist Werner von Braun helped launch the American space program. It was here where the rockets that put a man on the moon were built, earning Huntsville its nickname as the Rocket City. When von Braun moved to Huntsville, he relied on the town's resourceful farmers to invent the tools needed to build rockets. "That's what the Apollo-era rocket science was all about," Taylor said after the premiere. "It was the Rocket City Rednecks that did that." Taylor's nephew and brother-in-law are also on the show. "Mama" even makes a few appearances, mostly to yell at Daddy for stealing the plumbing from her new bathroom to build a whiskey still. The only thing the Rednecks seem to enjoy more than explosions is drinking beer. Travis Taylor even has his own music video, which was shown after the premiere, aptly titled "Drinking Beer." "Where will the cans come from?" one of the Rednecks asked when they set out to bomb-proof a truck. "Have you met Rog?" Taylor deadpanned, referring to his sidekick Rog Jones, a trailer-dwelling maintenance man with a genius-level IQ. About 500 beer cans were used to design vehicle armor that would be lighter than what the military now uses to shield troops from IEDS, or improvisational explosion devices. "We're not trying to save the truck," Taylor said. "Whoever's in there driving or riding, we want to make sure they survive." As one might expect from a show that has both "rocket" and "rednecks" in the title, the episodes are full of trial-and-error escapades and close calls. Taylor has a brush with disaster while wiring explosives to his rocket. The normally laid-back Taylor even loses his cool after wasting hours of work on a failed beer-can armor prototype. Travis has an innovative idea to make Humvees more resistant to roadside bombs, and it involves about 500 beer cans. He tested his armor on his nephew's old Ford pickup truck. "He claims he didn’t go diva, but he went diva," Jones said, which got the biggest laugh from the family-and-friends crowd at the world premiere. But the friends usually laugh off the tense moments. A fresh batch of moonshine leftover from launching rockets helps. "Come to think of it, man, why are we wasting all this good 'shine," Jones said. "We ought to be drinking it." You can follow OurAmazingPlanet staff writer Brett Israel on Twitter: @btisrael. Visit SPACE.com for the latest in space science and exploration news on Twitter @Spacedotcom and on Facebook.